Smart_Projector Pharma has been recognized as the leader instrument for Primary Pharmaceutical Packaging quality control. 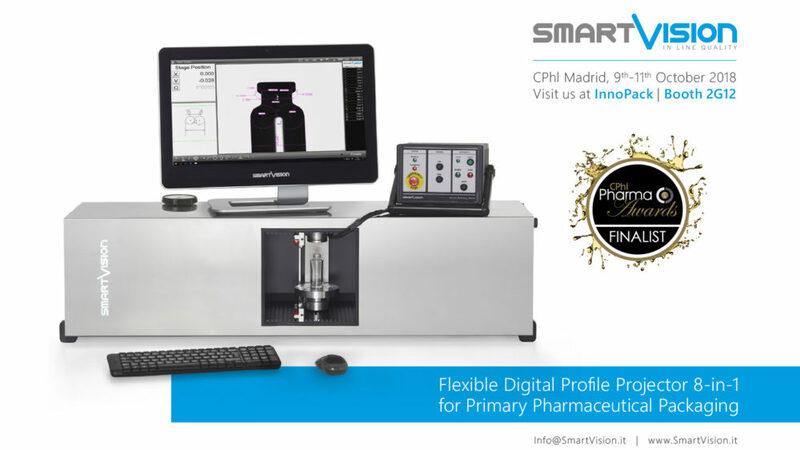 Smart_Projector Pharma is the first and exclusive instrument designed to perform easily and fast a complete and automatic check of any cylindrical parts such as bottles, vials, syringes, ampoules and cartridges, even if transparent. CPhI Worldwide is the world’s largest pharmaceutical event with over 28 years’ experience of bringing together the movers and shakers in pharma. Together with co-located events InnoPack, ICSE, P-MEC and FDF, the show hosts over 45,000 pharmaceutical industry professionals from 150+ countries. CPhI Worldwide will take place from the 9th to the 11th of October 2018 at IFEMA, Feria de Madrid, Spain. Make sure to visit SmartVision at stand 2G12 Innopack.